To further help maximize your home’s performance, we offer a free insulation inspection of your home’s attic. According to Energy Star, a well-insulated attic can help you save up to 20% on your heating and cooling energy bills every year. Our visit to homes in Indianapolis and throughout the entire state of Indiana includes checking your existing attic insulation levels and immediately letting you know if you are losing money through inefficient insulation. An under-insulated home loses up to 40% of its conditioned air through the attic, costing you money. 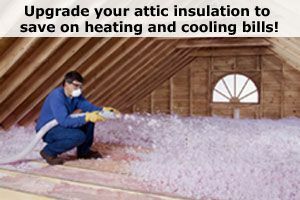 In today’s energy-conscious world, why waste that kind of energy and natural resource when well-installed attic insulation can help to keep heat in your home where you need it? AttiCat Insulation by Owens Corning saves home owners in Indianapolis and all of Indiana a good deal of money. That’s why we have partnered with Owens Corning, the energy efficiency experts, to provide this opportunity to our customers only. We want to make sure our customers are maximizing their opportunities to save on the escalating cost of energy.